I'm back with 14 add on pieces for the Nooks and Niches Set, now with seating options. The domelike niche pieces are deep so try to avoid placing directly backing a wall. 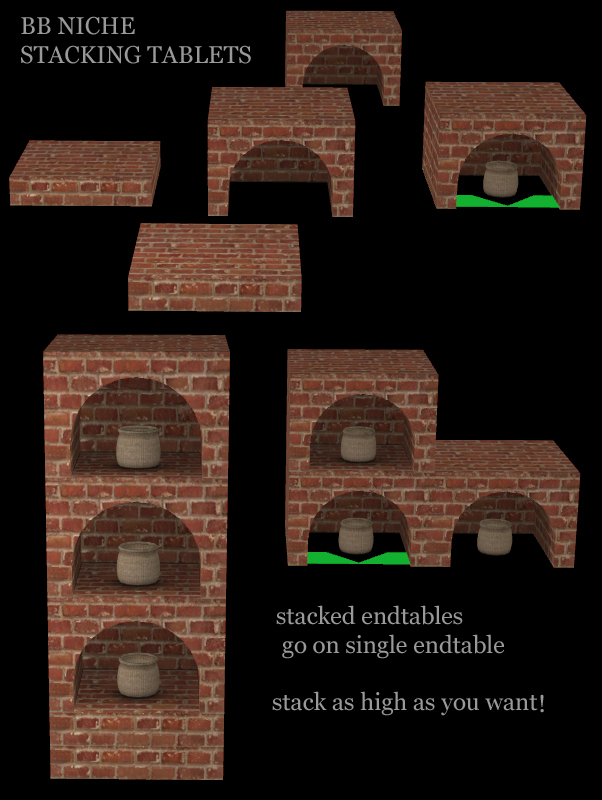 There are also a couple of endtables that will stack on top of each other. It's a bit fiddly at first but once you get the hang of it, I'm sure you won't have any trouble. 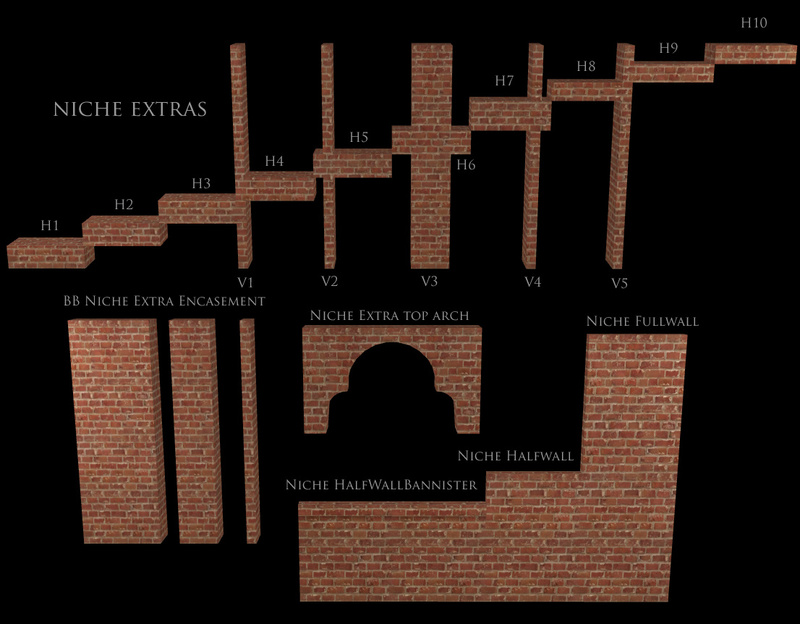 If you haven't already got it you will need the Master Mesh from the Nooks and Niches main set. Lastly I have included an updated collection file so just let it override the existing one. These were made by request as some last extra bits. A separate collection file is included for ease of use. Thanks Nat, these are all fantastic! You get us all excited with thinking of all the possibilities, that lie dormant in your new sets. Another classics from BB! 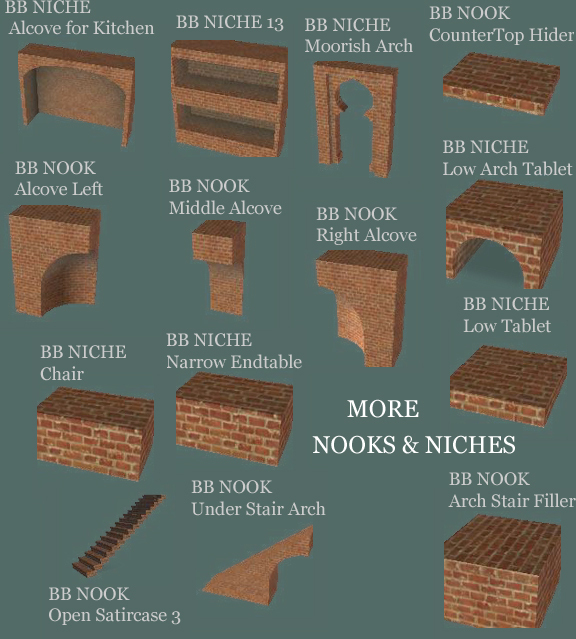 Nat you're just wonderful, so many different ways all these nooks and niches can be used. Big, Big hugs and lots of love judith. Oh my.....you are spoiling us, Nat! These open up all kinds of possibilities, thank you! These are all amazing. Thanks so much for all of your hard work Natalie! I'm in total awe! Creators like you are why I've been playing this game for going on eight years now, and I'm still lovin' it! These are wonderful! Thank you so much Natalie :) ...I can't wait to recolor! These are gorgeous! Thanks, Nat. WOW!!!!!!!!!!!! Fantastic. Thank you very very much!!! Beautiful, I love this, I am going now to play to see how beautiful this set will be in my houses. Thank you! I love the shape of that extra top arch. Thanks Nat! Thank you so much for your extra bits too, the set is awesome! As these are so incredibly awesome, it's not really surprising that you're out of bandwidth. XD Ah well, I can wait. Amazing work. Thank you so much for everything in this set. It's definitely one of the best I've seen. 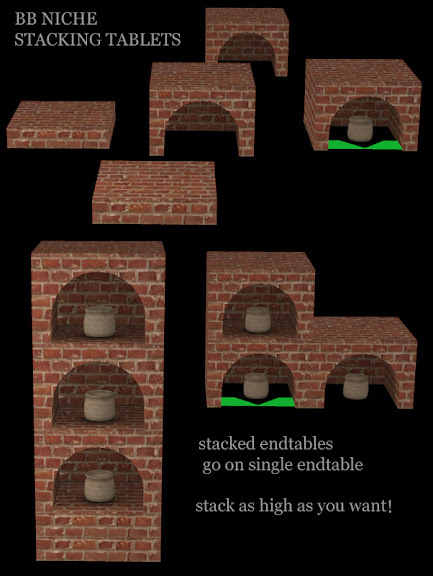 I haven't figured out what to do with the original nooks you made, and here you are making even more options... Simply amazing. Thank you. 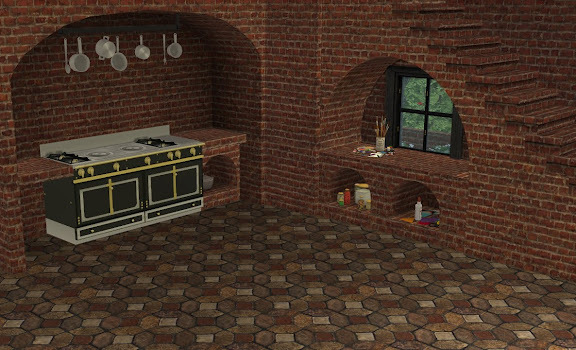 After a little struggle with my firewall or whatever that was, I was able to download...I can hardly wait to use the set and thank you for all the amazing items you have included in this set...I have a question...The stairs is a new mesh and need the Scriptorium to work? I guess I'll find the answer in the package...Thanks! The Scriptorium is only needed for modular stairs so these will work just fine without a script. I swear this is the best custom content that I've found yet. I always wanted something like this in my game and could never find it! You rock!!!!! By the way between all the custom content available on the web, I love you and Phoenix Phaerie the best!!!! This is one of the coolest downloads to ever grace themselves in my download folder. I see a middle eastern sim owning a nice Turkish bathhouse with this. This set is amazing! I always want to thank you for such great creations. I dont see a thank you button only a comment button so I have downloaded and been unable to just say thank you. THANKS A MILLION FOR SHARING YOUR TALENT!! Oh wow - I love your set so much. There are now so many opportunities to build, thank you for your work. 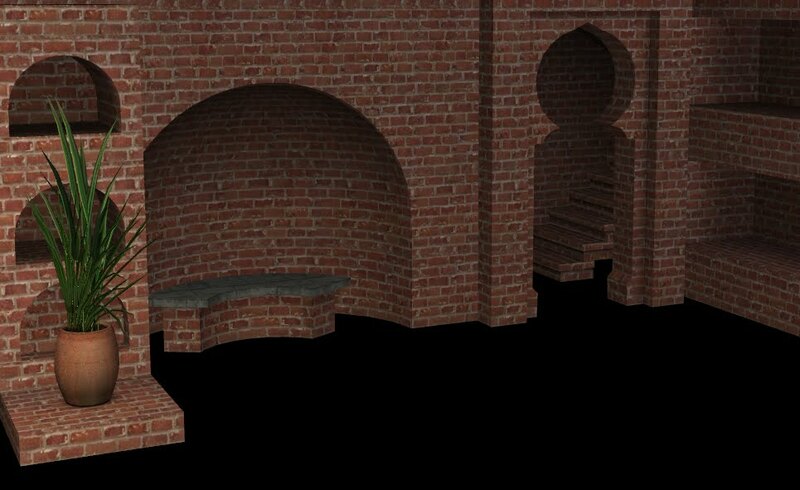 I have an extra arabic game and I like the arch "BB_Niche_Moorish_Arch" so much. 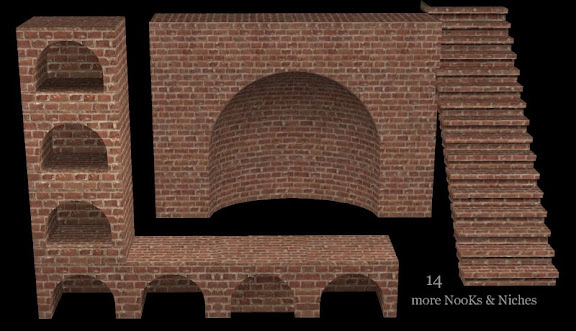 I would Be really happy, If Sims could walk through this arch. They alway stop before, even I use "Silent Lucidity Walk Throug Block". Could you please update this mesh, this would be great. It's a 2 tile object so sims would walk through the walls and not the arch which isn't acceptable for me. 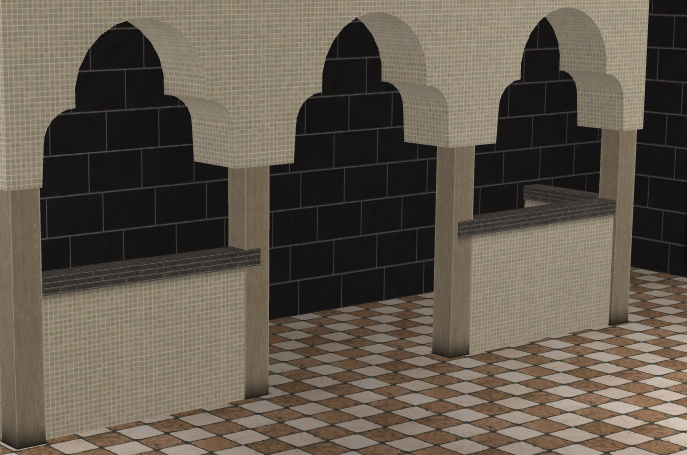 In order for them to walk through I would have to make an entirely new mesh on 1 or 3 tiles and that is something I am not prepared to do now as I have other projects I am interested in. I LOVE this set! I use it in almost everyone of my houses, in almost all of my neighbourhoods! (Each neighbourhood has a different theme/time frame) May I make a request though? I would really love it if you would make it so that the arch that spans two squares has the placer square in a third square... THat probably doesn't make much sense, but I love to make 'thick stone walls' all around my room and then put the two square stone arch so that there is a niche 'built into' the wall... Then I put a double bed into the niche. It looks really cool, but then the sims can only use one side of the bed... Any ideas? The problem is not the arch, it is the fact that you have a double bed up against the wall. I think there is a mod for that but you will have to google or ask elsewhere as I do not have links and would have to google myself to find it. These look great. Awesome job! Though none of the download links are working. They redirect to the Box host but none of the files download. Maybe Box is having some problems? Agrees with Alex ^... They are gorgeous builds, but the downloads link doesnt work, I even waited til the first of the month thinking it needed bandwidth reset time, but still not working. Yep, same here, downloads on Box are not working...tried all their troubleshooting tips too. 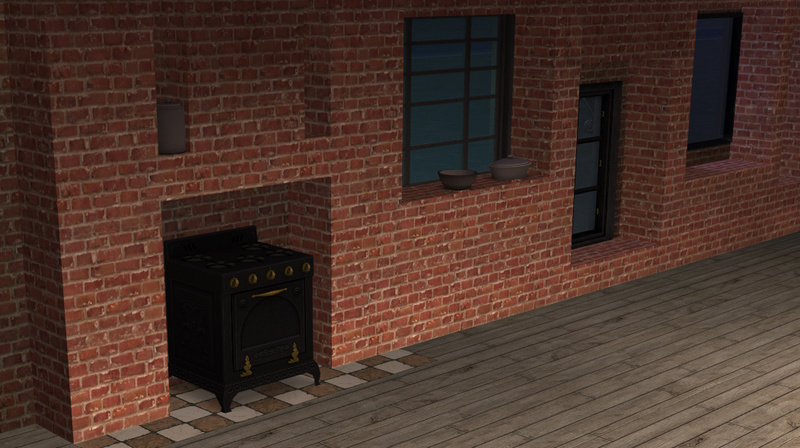 This is happening for multiple simmers (Remisims files have the same problem for me). Maybe the folder view (not the direct file link) would work? I've had good luck with those Box downloads recently. Thank you very much for the opportunity to download these files from sources which it refers. Box does not respond and not be you, so to these wonderful creations will not. Thanks again to you and also a huge thanks and appreciation creator of beautiful objects in the game The Sims 2. Sincerely Marika. P.S. Sorry if I write incomprehensible, I do not speak English and I used Google Translate. Thank you very much Kiri for the opportunity to download these files from sources which it refers. Box does not respond and not be you, so to these wonderful creations will not. Thanks again to you and also a huge thanks and appreciation creator of beautiful objects in the game The Sims 2. Sincerely Marika.